If you thought right-wing racist stupidity was confined to the EDL you would be wrong. Not only does the world have to deal with the absurdity of America’s Tea Party, there is also the grandaddy of them all, Australia’s One Nation party. An extreme right-wing party formed in 1997 that spouts the same Islamaphobic, anti multicultural, populist shite we are seeing all over the western world these days. 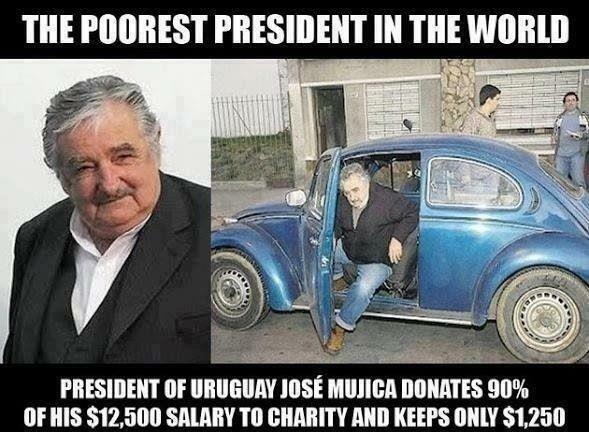 Full respect to the president of Uruguay Jose Mujica. Not only does he see sense about the disastrous effects on both his country and the world from the so-called war on drugs but he is also a damn decent kind of chap who drives around in an old Volkswagen and gives most of his salary away to the poor. I would suggest the politicians of our corrupt western societies take note, this is the future. A protest is today being held outside the headquarters of mega security corporation G4S in support of 5 children from the village of Hares who have been falsely arrested, tortured, kept in solitary confinement and forced to give false confessions, all of which has been facilitated by G4S. 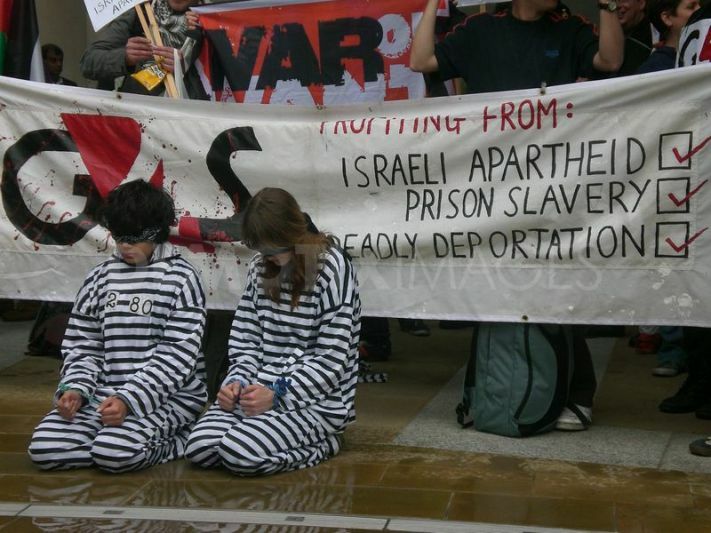 G4S has long had close ties with many aspects of the Israeli occupation of the West Bank. It has provided security for a large number of businesses illegally located in the occupied west bank. It has provided equipment for the many checkpoints that surround that area. It also has a close relationship with the police including providing them with much equipment and even building then running the police training centre. Most controversial though is its providing of services to Israels prison service including its “security” prisons where all the political Palestinian prisoners are kept and abused. On 14th March 2013 in what appears to have been a car accident when a illegal settler car crashed in to the back of an Israeli truck which had stopped due to a flat tire resulting in four people being hurt, was later at the behest of angry settlers presented as an attack by Palestinian stone throwing youth. Over the next few days over 50 masked Israeli soldiers stormed the local village of Hares in the early hours of the morning and in waves of violent arrests kidnapped the children of the village. In total 19 children were taken to the infamous G4S secured children’s dungeon at Al Jalame where they were violently tortured and locked up in solitary confinement for up to 2 weeks in windowless 1m by 2m cells with no mattress. To coerce confessions from the boys, sexual threats were made against the female members of their families. 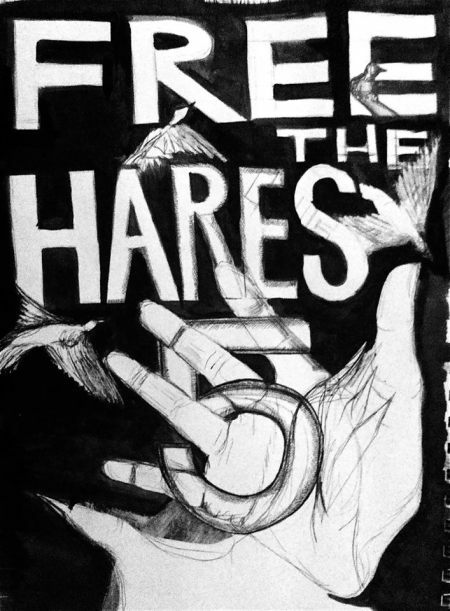 After extracting confessions under torture, five of the Hares boys were charged with 25 counts of attempted murder even though there were only four people in the car. Apparently the military court had decided that 25 stones were thrown, each with an “intent to kill”. The five boys – Ali Shamlawi, Mohammed Kleib, Mohammed Suleiman, Tamer Souf, and Ammar Souf are currently locked up in another G4S secured facility – Megiddo prison where G4S provides the entire central command room. The next court hearing is on 25th July. A study conducted by the Israeli NGO ‘No Legal Frontiers’ over a 12 month period concluded that 100% of Palestinian children brought before the Military court are convicted. If the five boys are convicted they will be locked up for 25+ years – five young lives ruined with no evidence of a crime let alone their guilt. Please join us on Monday 22nd July (3 days before their next hearing) to demand the immediate and unconditional release of all the children and to hold G4S to account for its complicity in Israel’s crimes, particularly in the torture of Palestinian children. So lets hold this company to account. Not just for the Hares Boys. Not just for all the Palestinians suffering under the aegis of G4S. Not just for their deceptions in their dealings with the UK state in many many forms. No this monstrosity of a firm is a worldwide menace, it makes its profit of the suffering of others. Its whole raison d’être is to support authoritarian regimes no matter what, as long as it makes them money. There is not a compassionate bone in any one of its directors. Truly if ever there was a company that represents all that is bad about capitalism and imperialism then G4S are your guys. On Tuesday the EU imposed a ban on giving aid to Israeli companies and institutions that are operating in the occupied territories of the Golan Heights, the West Bank and East Jerusalem. As you can expect many Israeli Zionists voiced their outrage that other nations would find their illegal settlement building to be, well…. illegal, and so wanted nothing to do with it. All the usual accusations were thrown around – including, interfering in the peace process ( what peace process? ) and the standard claim of anti-Semitism. Amusingly one pro Zionist voice claimed this EU ban was a bad idea because it would make the Palestinians suffer. PA officials approach EU, saying that Palestinian laborers are going to lose their livelihoods as a result of the decision to exclude settlement enterprises from future cooperative agreements • Leading manufacturer calls move illegitimate and harmful. This is quite a new tactic from apologists of the settlement program. They are trying to argue that by hurting them, anyone who refuses to deal with Israeli occupiers are actually hurting the Palestinians more by depriving them of much-needed menial jobs working for their Israeli masters. Now ask any Palestinian whether they would prefer the “security” that goes with a seriously low paid menial job working for their occupiers OR the chance of working on that very same land but as the rightful inheritors of land that has been in their people’s possession for generations before the occupation. I think we all know what the answer to that would be.